What is meant be the design of structures? Is it an arbitrary or scientific process? How to design a structural system? Parameters involved in the design? What is meant by demand on structural system and what is capacity of a structure? Is demand related to capacity? 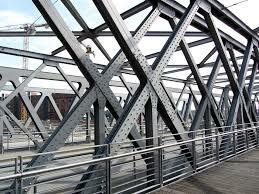 What are the requirements of steel design? Demands: Snow, earthquake, live load etc. A condition beyond which a structural system or a structural component ceases to fulfill the funtion for which it is designed. It considers the variability not only in resistence but also in the effects of load. Provides measure of safety relative. Safety in the design is obtained by specifying that the reduced nominal strength of a designed structure is less than the effect of factored loads acting on the structure. Ability of a structure to go through in-elastic deformation without rupture. It is the ability to redistribute the load. Simple beam is determinate. Fixed beam is indeterminate by 2 degrees so it has two redundant actions. fixed supported beam is more better as indeterminate structure can redistribute the load. When load increases support becomes plastic and it turns into a simply supported beam. But simply supported does not go through the stage of plastic hinge rather they fail directly. It is the ability to resist abrasion. Maximum load which an object can resist. OR it is the maximum load that the steel can resist before failure. Steel is said to be failed when it has yielded. It is thus called yield strength. Ability of a structure or structural component to absorb energy. It is a progressive, localized permanent damage under fluctuating stress. LRFD accounts for both variability in load and resistence. It achieves fairly uniform levels of safety for different limit states. ASD is the simple method & LRFD is the sophisticated one. ASD combines dead and live loads and treats them in the same way. In lrfd different load factors are assigned to dead loads and live loads, which is appealing. Changes is load factors and resistence factors are much easier to make in lrfd. All the members in the structure should have adequate strength, stiffness and toughness to ensure proper funtioning during service life. Members should have adequate strength, stiffness and toughness to ensure propoer functioning during service life. Variability of strebgth of materials from those specified. Variation in strength due to workmanship, construction practices. Goal is to prevent limit state from being reached. If the structure is a building, for instance, the designer must create a plan that has suitable arrangement for rooms, corridors, stairways, windows, elevators, emergency exits etc and all this plan should be adapted to site so that it is feasible, accepted aesthetically and at a reasonable cost. This is called funtional planning. Structural scheme is dependent on funtional planning. Structural scheme includes the location of columns in the buildings, it is to be worked out with the funtional plan and sufficent space must be anticipated between finished ceiling and finished floor for location of columns. Once loads are defined and design is laid out, structural analysis must be performed to determine internal forces that will be produced in various members of the framework. Assumptions must be made and it should be ensured that structure in reality also behaves as it is supposed to (and as it was assumed to behave). Members must be proportioned with factor of safety in mind. The development of design specifications to provide suitable values of the margin of safety, reliability and probability of failure must take into consideration the following factors. Based on linear elastic behavior of the material. The stress is in allowable limits. The full strength of the material is not utilized but we use less value as the limited stress value. Full strength of the material is not utilized but less value is used as the limited stress value. In ASD we assume that internal stress in a member is zero before any loads are applied i.e. no residual stresses exist in the members. This is important in steel relatively. ASD combines dead and live load and treats them in the same way and does not give reasonable measure of strength. As strength is more fundamental measure of resistance than allowable stress. Safety is applied only to stress. Loads are considered to be uniform. To overcome the above limitations and drawbacks LRFD was evolved. Assumption is that stress in the member is zero before any loads are applied i.e. No residual stresses exist in the members. This is important in steel relatively, because during manufacturing of steel when it is cooled, the rate of cooling at the top is different than at the bottom or middle and so it causes differential cooling, thus, introducing induced stress internally. Does not give reasonable measure of strength. As strength is more fundamental measure of resistence than is allowable stress. Safety is applied only to stress level. Loads are considered to be uniform. If not, only option is the factor of safety.